Unifiller is pleased to announce the German engineered Boyens Glaze Sprayer, designed to draw ambient temperature glazes directly from a container, heat them and then spray the warm glaze onto pastries and other products. Unifiller Boyens is pleased to introduce its new Glaze Sprayer Economy with Glaze Jellies - an advanced technology in jelly spraying that doesn’t use the conventional water bath technique, but rather a high performing in-line continuous product heating system. The German engineered Unifiller Boyens Glaze Sprayer is designed to draw ambient temperature glazes directly from a container, heat them and then spray the warm glaze onto pastries and other products. The sprayer can be used with a wide range of commonly available glazes, but works best with the Bag In a Box Jellies, available in 3 flavours, exclusively from Unifiller. The launch of this new machine comes in response to challenges faced by the bakery industry in dealing with conventional methods such as using a water bath, burner stove, pot and brushes. The Glaze Sprayer’s in-line heating system means bakers no longer have to deal with heating sticks or coils burning out and leading to premature corrosion. No water bath means no filling or refilling of water required. ·Consistent glaze temperature – so glaze is never too thick to apply or too thin as to cause waste. ·Consistent and portion controlled application, so there’s no product waste. ·Spraying application means no glaze contaminates to worry about as is often the case with brushes that can leave bristles behind on pastries. ·Internalized heating means heated glaze is contained in a safe system during the entire process, eliminating boil-overs and injuries from burns or transporting jelly. ·Easy to use, with minimal setup and cleaning. 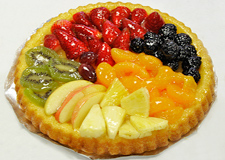 ·Extend shelf life with a glaze that’s fruit acid and freezer stable, while enhancing the taste and look of your products. ·German-engineered, stainless steel equipment made to last. For more information about the Unifiller Boyens Glaze Sprayer visit http://www.glazespray.com. About Unifiller: Unifiller, a global provider of depositors and cake automation equipment, helps streamline production operations by providing solutions for achieving higher output, greater weight accuracy and better product integrity with an extensive range of single piston depositors, transfer pumps, multiple head units and fully and semi-automated production systems.